Whether on commercial or residential property, tree stumps can be both unsightly and hazardous. Tree stump removal is a complex, difficult and sometimes dangerous task. Once a tree is removed, you must consider what to do with the stump. Often, tree stumps are strongly embedded in the ground, their complex network of roots making them difficult to remove. Other times, a stump’s roots are intertwined with underground utility lines such as power and gas lines. 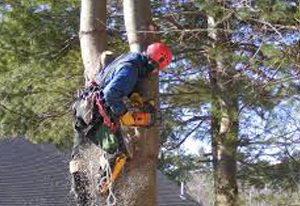 Due to the complex nature of tree stump removal, hiring an expert like Adirondack Tree Surgeons is recommended. Our specialized equipment and professional expertise have allowed us to continually serve customers in Warren, Washington & Saratoga Counties for over 30 years. With substantial experience in stump removal, our expert team of tree specialists can effectively and efficiently remove any unwanted stumps from your property. Using state-of-the-art, specialized equipment, we can grind out tree stumps and clear away any debris left behind, leaving the area ready for planting grass, gardening or other landscaping improvements. If you’re looking to safely remove a stump from your property in Saratoga, Lake George, Glens Falls, Clifton Park, Malta, Ballston Spa or within other areas of the Capital Region, look no further than Adirondack Tree Surgeons. With more than 30 years of experience, we are the premier tree stump removal and stump grinding service provider in Upstate NY. Contact us today for more information about our tree services including lot clearing and to get your free estimate.